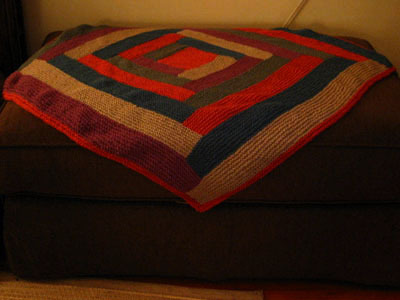 The log-cabin blanket is done (save for weaving in ends), and I'm really happy with the way it turned out. It still doesn't have an intended recipient, so I think I might hang on to it. After all of those stitches, I've grown attached to it! You can see the whole blanket here. Final Notes! 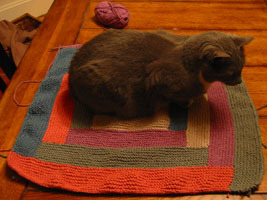 Project Name: Log Cabin Blanket Pattern Source: No pattern needed, but tutorial on long cabin knitting found at Mason Dixon Knitting Name of Yarn Used: Mission Falls 1824 Cotton Amount of Yarn Used: 3 balls Sand (104), 3 balls Coral (201), 2 balls Phlox (405), 3 balls Sea (402) and 2 balls Fennel (301) [I started out with two of each, thinking that I'd need the same amount of each color. Wrong! 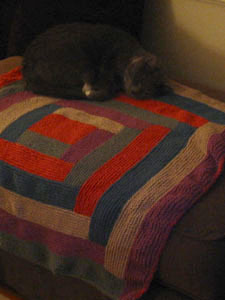 Remember, each stripe requires more yarn than the previous stripe. Also, the center patch burns up a lot of that color's yarn.] Needles Used: No. 6 Addi Turbo circulars (the balls band calls for No. 7s but I couldn't find mine and my No. 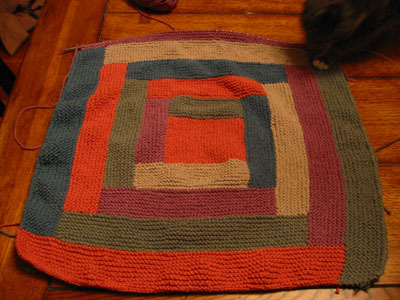 6 circulars are longer [40"], which is necessary when making a blanket of indeterminate size!) Other notions used: n/a Deviations from the Pattern: n/a Other Comments (what I wished I'd known before I started this project): *Don't forget to do a loose bind-off to avoid the "gathered" effect at the top of every stripe. *I love the colors that I picked, but looking back I sort of wish that I had chosen colors that contrasted each other more. Also, I should remember to try to be more daring next time -- I only chose five colors and I've been using them in the same order. Next time, go crazy! *Next time try a light color as the center square. *When picking up stitches for the next row, be consistent. Pick up stitches between garter ridges when traveling perpendicular to the stripe, and pick up stitches on a one-to-one basis when traveling parallel to a stripe. Be sure to pick up the last stitch as close to the end of the fabric as possible to keep the next stripe from sloping down at the end. This winter, I hit my first-ever knitting slump: my rate of knitting fell precipitously and no projects -- in-progress or potential -- seemed appealing. Heck, I even walked past open yarn stores without going in. (Tragic, I know.) By the beginning of February, I was worried that I had lost the zeal for knitting. I'm happy to report that it was a false alarm. 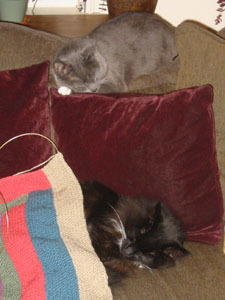 As soon as the days started to lengthen, it seems, my urge to knit returned. I knew I was really back in the game when I followed Alison's link to the Mason-Dixon Knitting tutorial on log-cabin knitting -- and could think of nothing else for days. Hill Country Weavers is a charming establishment, complete with front porch seating for knitters and an elderly black lab wandering the aisles "assisting" customers. (Sadly, they do not have a web site that I can find. Happily, Yentala did a virtual tour in December!) I already knew what yarn I wanted (Mission Falls 1824), and Alaina helped me pick colors. This is the epitome of mindless knitting, and I'm loving it! *Don't forget to do a loose bind-off to avoid the "gathered" effect at the top of every stripe. *I love the colors that I picked, but looking back I sort of wish that I had chosen colors that contrasted each other more. Also, I should remember to try to be more daring next time -- I only chose five colors and I've been using them in the same order. Next time, go crazy!